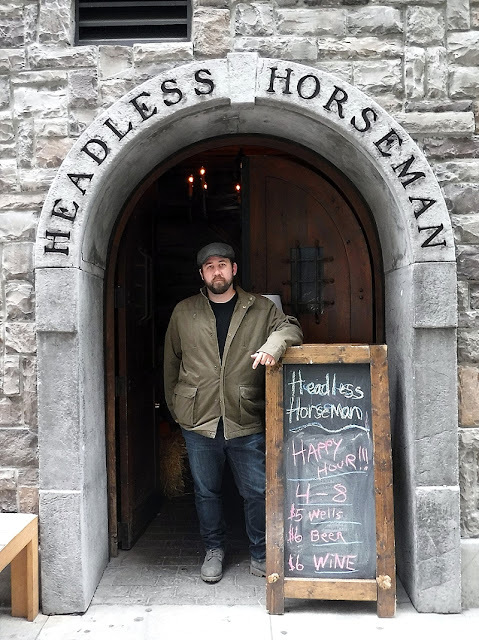 October 10, 2017 — Let’s say that you wanted to visit the land of the Headless Horseman. That you aimed your car for the spook-themed town of Sleepy Hollow in the glorious Hudson Valley of the state of New York. Now let’s say you missed a turn and found yourself on the chaotic metal and glass island of Manhattan instead. They are, after all, only 20 miles apart. What would you do? I’ll tell you what you should do: Head to the Gramercy Park neighborhood to hit up Irving Place. Last October, my wife and I spent the day in Manhattan. We were there to visit a replica of the Psycho House stuck atop the MET. To dine at a Tim Burton-themed restaurant. And to see some Washington Irving sites…because I love me some Headless Horseman. 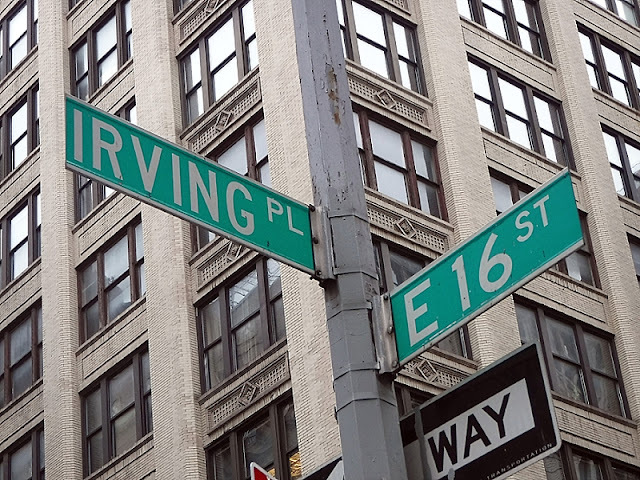 Irving Place extends about six blocks, from E 14th Street to E 20th street. And I’d like to tell you that the entire stretch is themed with Washington Irving and his signature story, but it’s not. However, they are referenced here and there in major ways. Like at Washington Irving High School. And the Headless Horseman Pub. And the Irving House itself. The main image is a relief of the author in profile, and he’s surrounded by characters from his stories and scenes from his life in New Amsterdam and Tarrytown. And yes, the Headless Horseman is there, the imagery looking like it might have been based on the William Wilgus painting of the chase scene from the story. 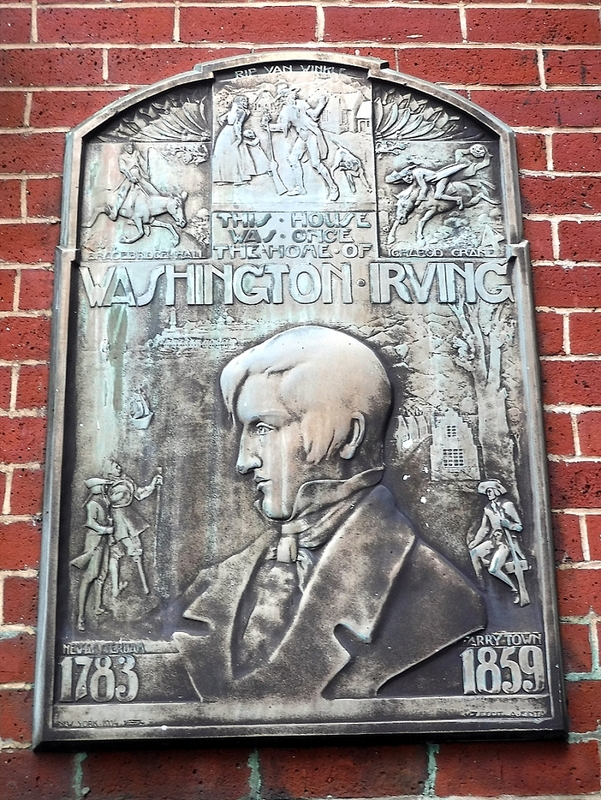 Across the street is Washington Irving High school, which has a bust of its namesake author right there on Irving Place, staring across the street at the brick building with the plaque proclaiming his home. Unfortunately, that bust was missing during my visit, replaced with NYC’s constantly accreting construction scaffolding. But that was semi-fine. It was the next place that I really wanted to see. And drink at. I’ve been to a lot of spooky bars in Manhattan. The Jekyll and Hyde Pub. The Slaughtered Lamb. The afore-referenced Beetle House. But my favorite is right there at the corner of Irving Place and E. 15th St.. 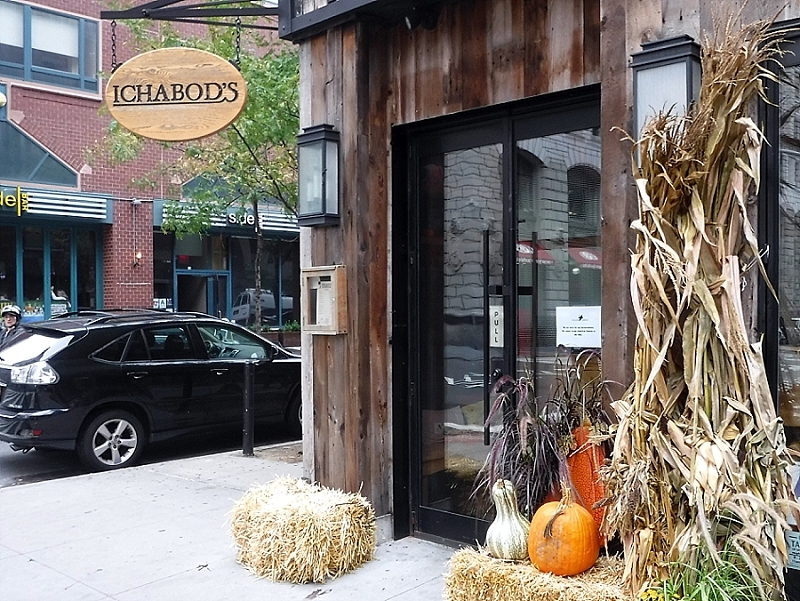 There I found the rustic wooden exterior of a restaurant called Ichabod’s. On my visit, the entryway was adorned with corn shocks and pumpkins, hay bales and gourds. I assume that’s because it was October, but I like to fantasize that it’s a year-round ambiance for them. However, I wasn’t headed—so to speak—to Ichabod’s. I was headed next door, just a few steps down E. 15th St., where another rustic exterior, this time of gray stone, loomed above me, it’s large wooden door open and inviting: The Headless Horseman pub. 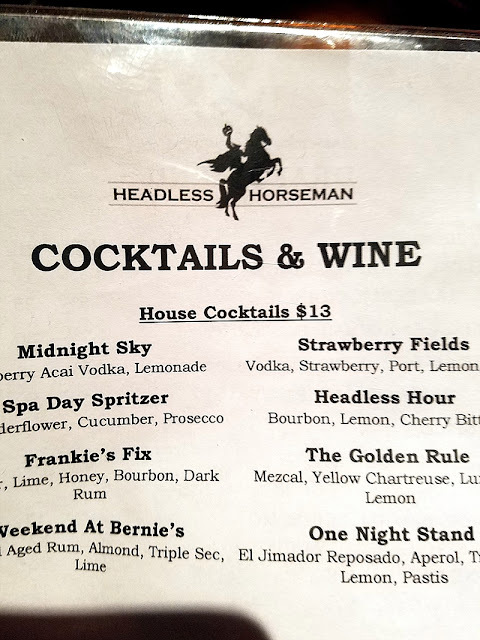 Stepping inside the Headless Horseman is like stepping into a colonial tavern. Lots of bare wood and raw brick. The barstools are wrapped in leather that looked like repurposed saddles. It only needed straw strewn on the floor. The whole ambiance was extremely comfortable, something that’s not always easy to find in a place like Manhattan. 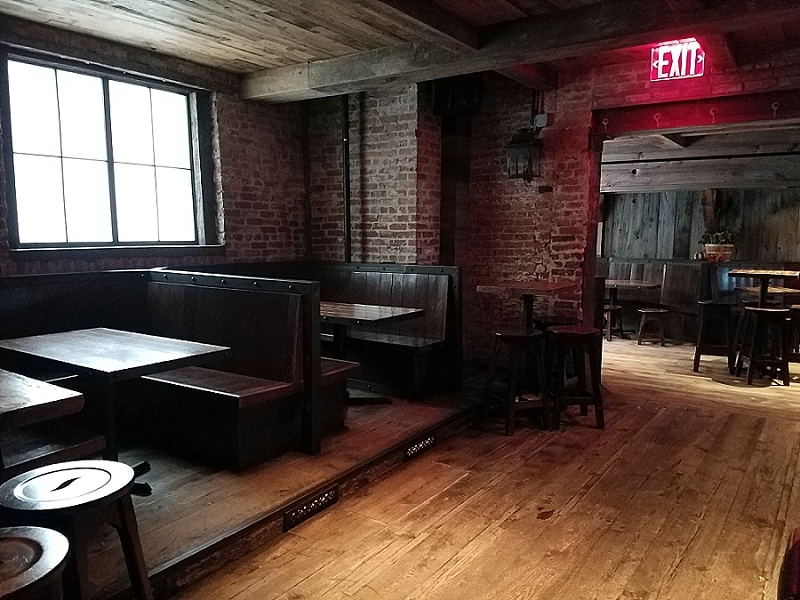 I pulled up to the bar, right beside a foam pumpkin carved with the image of the eponymous spook, ordered a hard cider, and waited for Bram Bones to slip out from behind the bar and tell me a tale that would make me quake my way back home across the George Washington Bridge. The only thing I’d really ding it for is not having a themed cocktail list. I want this pub in my city. No. My neighborhood. No. My backyard. Now. Here’s the punchline to this article. As far as we know, Washington Irving never once lived at the Irving House, nor did he live anywhere in the vicinity of Irving Place. That’s right. That plaque is lying to every single passerby. 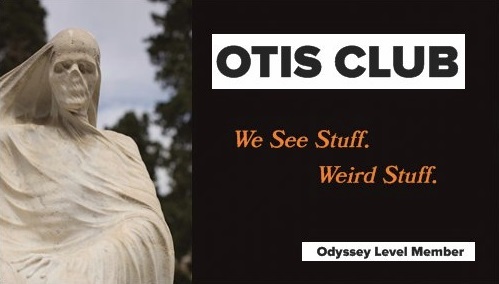 The myth that he lived there was probably, at least in part, based on the name of the area. 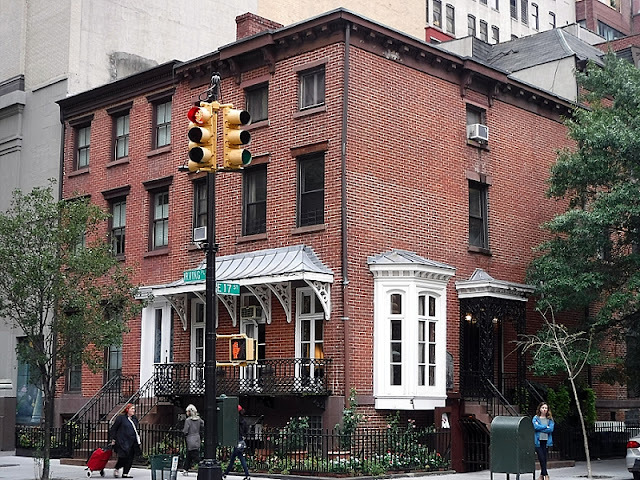 Because Irving Place predates the Irving House, and was named such by the developer, who was a friend of Washington Irving’s and wanted to honor him. Little did he know how far that honor would go.